HISTORY: Instruments similar to the Alphorn (Australian Didjeridu, Bibilcal Shofar) have been in existence for nearly 100,000 years. The early instruments were used to signal warnings often for military use, but in the mountainous area of the Alps, it was more commonly used to announce daily activities. Archaeological records of the Alphorn in Switzerland date back to the Celtic tribes on the northern slopes of the Alps about two thousand years ago. References to the modern Alphorn in Switzerland date to the early 16th century. By the 18th century, Alphorn melodies were written down by composers who incorporated them into their own compositions (Johannes Brahms, Symphony Number 1, in c minor). 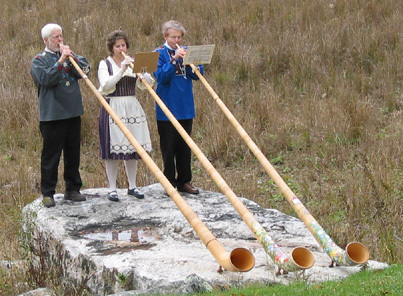 Today the Alphorn is not used by herdsmen for signaling, but primarily by amateur musicians. 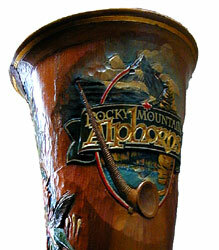 PHYSICAL DESCRIPTION: The Alphorn is a hollow tube made with wooden strips (spruce) bound with birch bark or cane. 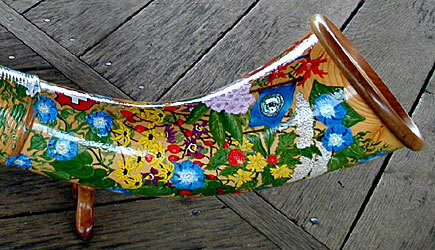 It is conical bore with an upturned (or straight) bell and wooden mouthpiece similar to that of the modern horn. They range in length from 10.6 feet to 13.5 feet. The bells are often ornately decorated with painting or carvings. The instrument is supported by small feet located under the bell. SOUND PROPERTIES: Sound is produced in a manner similar to brass instruments by the vibration of the performers lips. Due to its conical bore the Alphorn produces a mellow, and reverberant sound that can carry for long distances. RANGE: The instrument has a four-octave range. Since the Alphorn has no keys, valves, or slides, it is not a chromatic instrument. This means that it can only produce the pitches in its overtone series and cannot sound those pitches in between. The Alphorns are most commonly in three different pitches. The Alphorn with a fundamental pitch of F sharp is 11 feet, 6 inches long, the Alphorn with a fundamental pitch of F is 12 feet, 3 inches long, and the Alphorn with a fundamental pitch of E is 13 feet, 2 inches long. 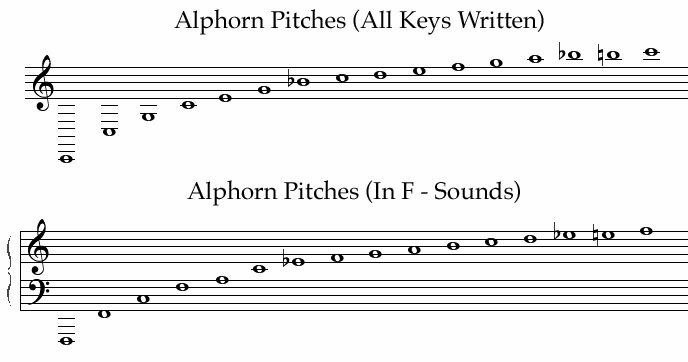 See alphorn-overtone-series in the Appendix.